Editor’s note: This past autumn, 2 physicians and a statistician published a significant article in the journal Noise & Health on the “Effects of industrial wind turbine noise on sleep and health.” This website didn’t feature the article, worthy as it is, until we could twist Dr. Pierpont’s arm to review it—peer review it, if you like. She has now done so, below. Comment on: Nissenbaum MA, Aramini JJ, Hanning CD. 2012. 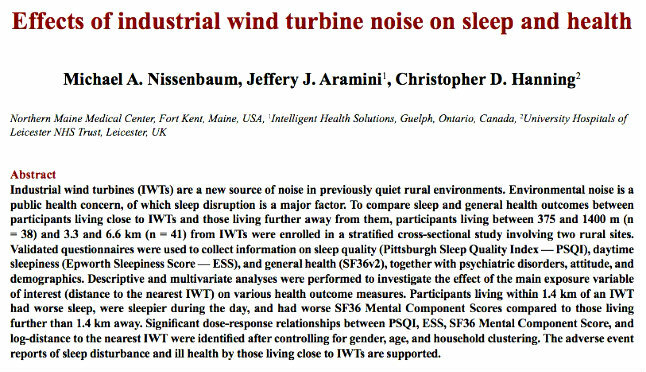 Effects of industrial wind turbine noise on sleep and health. Noise Health 14:237-43. This paper demonstrates a significant relationship between distance from wind turbines (as a marker for noise intensity) and questionnaire assessments of sleep disturbance, daytime sleepiness, and mental well-being. Physical well-being was also assessed by questionnaire but had no significant relationship to distance from turbines. » Study and control populations (near and more distant from turbines, respectively) were selected by a random sampling method and assessed identically using the same questionnaires. » The questionnaires are published and have been used and statistically refined in other populations for other kinds of problems. » The data was analyzed in a complex multivariate fashion by a statistician. » Significant relationships were found even though the sample size was small. It appears to me that the investigators limited the scope of their inquiry to maintain the above conditions with the goal of keeping the study focused, easily explained, and publishable (a strength). In the process, however, they disregarded salient aspects of the wind turbine noise problem which are harder to explain and more controversial (a weakness of this study from my point of view). » The focus on sleep quality and use of general questionnaires about well-being exclude the unique and striking health effects from wind turbines, which are at present borne out by the recent Shirley, Wisconsin (2012) noise study. These effects include nausea, headache, and cloudy thinking independent of sleep disturbance (see Pierpont 2009, Ambrose and Rand 2011, Rand et al 2011, Shirley Wind report 2012). » Physical well-being was assessed but results were not presented. Negative or non-significant results can also tell us something about a phenomenon and should perhaps be included. » The statistical modeling process used for drawing the regression (relationship) curves on the graphs is not clear. In what way, for example, were age, gender, and site incorporated into the regression (as noted in the descriptive legends of Figures 1-3)? How much of the variation in survey scores did these variables account for? » However, there are simpler results presented numerically in Table 3, showing near vs. far comparisons for the various measures used, with their degree of significance. We find there, for example, that the average Pittsburgh Sleep Quality Index is significantly higher (meaning worse sleep) close to turbines, with a significance level of 0.046 for near vs. far. The percentage of high results is not significantly different. The result for the Epworth Sleepiness Scale is similar, with the near vs. far difference in average value being significant at 0.032. The near vs. far difference in the average Mental Health well-being score is significant at 0.002, meaning it is 15 to 20 times more likely to be a real, non-random difference than the sleep measures. Significance levels for the calculated regression equations (relating scores to distance as a continuous variable and incorporating some other variables) are similar, as shown in the descriptive legends for Figures 1-3. » You can see this difference if you compare Figure 3 to Figures 1 and 2, looking at the patterns of scatter of the data points close to turbines compared to far away. The fact that you can see a clear difference between near and far in the mental health results, but not for sleep results, is reflected in the degree of significance of the results. The difference is due to the dense cluster of low points (poor mental health) for locations close to turbines, compared to only scattered, isolated low points for the locations far from turbines. » I am pleased that, unlike an earlier, draft version of their report, the authors no longer attribute the mental health effects to the sleep deprivation, but just note that both are significant health effects that vary with distance from wind turbines. They recognize that other symptoms they did not study may contribute to the mental health effects, drawing a parallel with low-frequency-noise-induced Sick Building Syndrome (page 242). » The discussion of mechanism is measured and seeks to comfortably embed wind turbine effects with other types of noise disturbance. In fact, there are qualitative differences due to the dominance of inaudible, low-frequency or infrasonic components over the audible components in wind turbine noise (see Shirley Wind report 2012). » These authors, like others who study wind turbine noise effects, asked their subjects before-and-after questions about their subjective experiences and preferences. These authors present these data in Table 3, showing significant near vs. far differences in responses to questions about changes when the turbines began operation, differences sleeping at home vs. away from home and turbines, and desire to move away. These kinds of subjective explorations are typical in studies of wind turbine noise, the results often discussed informally in an introduction or discussion. Face-to-face with affected people, researchers tend to step down from their posture as people who only measure objectively, ask natural before-and-after questions, find their own reasons for believing people, and present the information so gained as critical for their understanding of wind turbine noise effects (e.g., Ambrose and Rand 2011, Rand et al 2011, Shirley Wind report 2012). Only my study (Pierpont 2009) documented before-and-after effects systematically in a natural experiment case-crossover format, basing the entire analysis on the premise that believing what the subjects have to say about their experiences of wind turbine noise is both reliable and the most efficient means to develop understanding of these significant new noise-related phenomena. Though the scientific posture doesn’t recognize this kind of approach, every researcher does it anyway, because it is real and valid. Even Eja Pedersen did this, though she confined the results of her in-depth interviews (in which she discovered people driven from their homes) to her thesis (2007), never publishing them in a journal. » New research proposals in this field are wisely suggesting case-crossover formats. The 2012 Shirley Wind report, for example, recommends a short-term, prospective, experimental case-crossover exposure format using previously affected people, asking them to quantify their immediate sensory responses to wind turbines being on or off without other knowledge of the state of the turbines. This approach could clarify experimentally the sensory, low-frequency-noise-associated phenomena that disturb physical sensation and mental processes apart from sleep, contribute to sleep disturbance, and differ among exposed people. A Cooperative Measurement Survey and Analysis of Low Frequency and Infrasound at the Shirley Wind Farm in Brown County, Wisconsin. Submitted in expurgated form to the Wisconsin Public Service Commission on December 27, 2012 and in complete form on December 28, 2012; both forms are available with commentary here. Ambrose SE, Rand RW. 2011. The Bruce McPherson Infrasound and Low Frequency Noise Study: Adverse Health Effects Produced by Large Industrial Wind Turbines Confirmed. Available here. Rand RW, Ambrose SE, Krogh CM. 2011. Occupational Health and Industrial Wind Turbines: A Case Study. Bulletin of Science Technology & Society 31: 359-362. Pedersen E. 2007. Human response to wind turbine noise: perception, annoyance and moderating factors. PhD dissertation, Occupational and Environmental Medicine, Department of Public Health and Community Medicine, Göteborg University, Göteborg, Sweden. 86 pp. Pierpont N. 2009. Wind Turbine Syndrome: A Report on a Natural Experiment. Santa Fe, NM, K-Selected Books. 294 pp. Massachusetts state representatives understand the issues of noise ,infra sound / low frequency noise .They understand the mistakes made in Falmouth , Scituate , Fairhaven ,Kingston and other locations . Now comes the question what do they do ? Money talks and neighbors walk . Now we see the local Massachusetts towns understanding the poor siting of commercial wind turbines .The towns are pulling themselves apart over the finances of the turbines that are making people sick. The big question is who will pay to move the turbines . The facts are in commercial megawatt turbines don’t belong in resdential locations . The health of the residents should be the first thought of the local boards of health -stop the turbines now . Thanks again to Dr. Pierpont and Dr. Nissenbaum, and everyone else.. I dare say the health implications of sleep disturbance are easy to understand. But there are other physical effects produced by exposure to wind turbines being widely reported. Something about wind turbine sound emissions causes physical disturbances within the body. I suspect that body organs are resonating, resulting in headaches, cramps, twitching, nausea, strange vibrations in the chest,,, and cascading from there. Some of us are in the unfortunate (?) position of being able to sense these impacts. This is most disturbing, acutely discomforting, and PAINFUL. Proponents seem to address these observations about the “sensation” by switching between the statements: sound levels are below the “threshold of perceptibility”.. or else, “…below the threshold of audibility,” so that people like me can’t even tell whether these reports are being considered or rejected. This is frustrating, to say the least. One thing is for sure, however: the only thing worse than being a victim is to have your experience ignored and knowing that others will continue to be put at risk. Sustaining health damage is a loss that can never be recovered.